Muscular and strong, the Alapaha Blueblood Bulldog looks like a standard bulldog. They have drop ears, loose lips, high shoulders and cat-like feet. 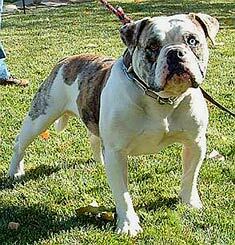 The Alapaha Blueblood Bulldog originated in the Southern US. Alapaha Blueblood Bulldogs come in blue merle, brown merle, red merle with white trim or chocolate & white. Short and stiff, the Alapaha Blueblood Bulldog's coat requires little grooming. This breed should be bathed bi-monthly. Alapaha Blueblood Bulldogs are average shedders. Loyal and obedient, the Alapaha Blueblood Bulldog will defend its family to the death. They are good with children, quick to train and love human companionship. The Alapaha Blueblood Bulldog makes an excellent guard and watchdog. The Alapaha Blueblood Bulldog comes from a small genetic pool and is thus prone to certain deformities such as inversion of eyelids. 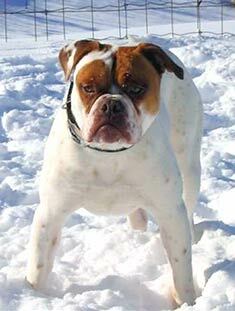 The Alapaha Blueblood Bulldog can be expected to live about 12-15 years. The Alapaha Blueblood Bulldog requires at least an average sized yard to fulfill its activity needs. This breed enjoys running free in a safe enclosed space. Alapaha Bluebloods enjoy long walks. Find Alapaha Blueblood Bulldog Puppies with our Free Breeder search!